Quite a massive heading for quite a massive project. Put together four organisations that all have specific skills and a combined desire to see the best possible outcome for our community here in Porirua and you have the amazing project called “Playable Porirua”. This project started as an idea that came from a young girl who asked her grandmother “why can’t disabled children play in the playground?" This question, in turn, was asked of me and the wheels started rolling. 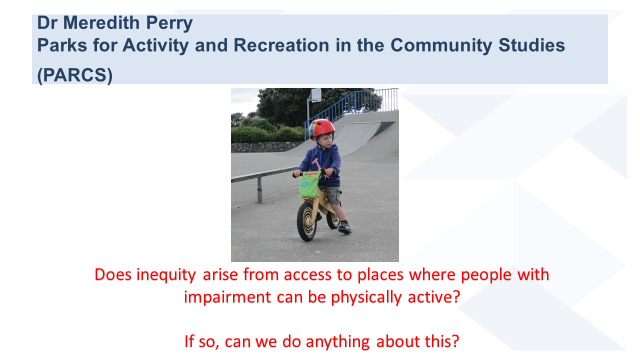 At that time a member of the Porirua Rotary Club had seen a Mobility Swing and we talked about that as a good idea for Porirua. The Council was very wary but also very interested. 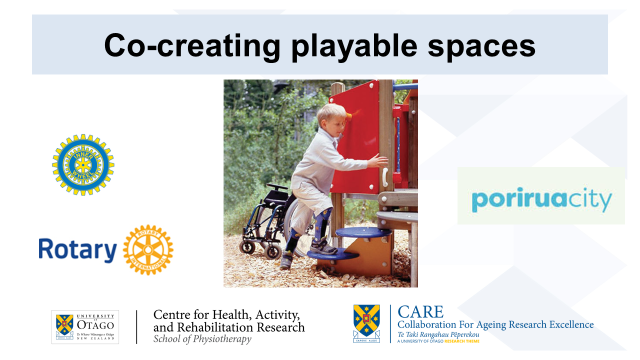 At the same time, the University of Otago Physiotherapy Research Team were looking at playable spaces and their value to communities - not just for children but also parents and grandparents. “Parks provide a place to be. They should be environments that anyone of any age can access, typically at no or low cost, and provide a sustainable opportunity to increase health and well-being in the population. to create a playable city where all children can play together in the region’s playgrounds and parks, whatever their abilities or disabilities. There are now some clear steps to take and, of course, some challenges. So much interest in this project has taken place that Dr Meredity Perry, Olivia Dowey, Parks Manager Porirua City, Christine Jacobson, Senior Policy Analyst Porirua City and I (Adrienne Murray from Plimmerton Rotary) were invited to attend a Research Impact Conference hosted by the University of Otago. We presented the project as a workshop for the conference. Considerable interest was expressed by the audience comprising Social Research staff, Health Policy Advisors and Council members from around the country. Both Rotary and Inner Wheel are now major partners in what is a significant programme of work for the community we live in. Watch this space! There is plenty of work to do which will leave a lasting legacy for our city. Funded by PCC, Rotary and Inner Wheel, University of Otago and ….. Original generation time 3.7441 seconds. Cache Loaded in: 0.0004 seconds.